As you’ll know from our taste and aroma notes, Fifty Pounds Gin ticks a lot of classic boxes. Juniper, coriander and citrus, with a clean finish and a touch of spice… it’s what you might call a “proper” gin. However, those with a more sensitive palate may notice assorted other flavour profiles. The Gin Foundry has decided to explore the realms of flavours and aromas to a greater degree, with the creation of the “Gin Wheel”, which explains some of the qualities of gin, aligning them to a variety of different categories, such as sweet, nutty, fruity or floral. And it’s the latter we’re looking at this month. Well, it’s summer – so many things are in full bloom. 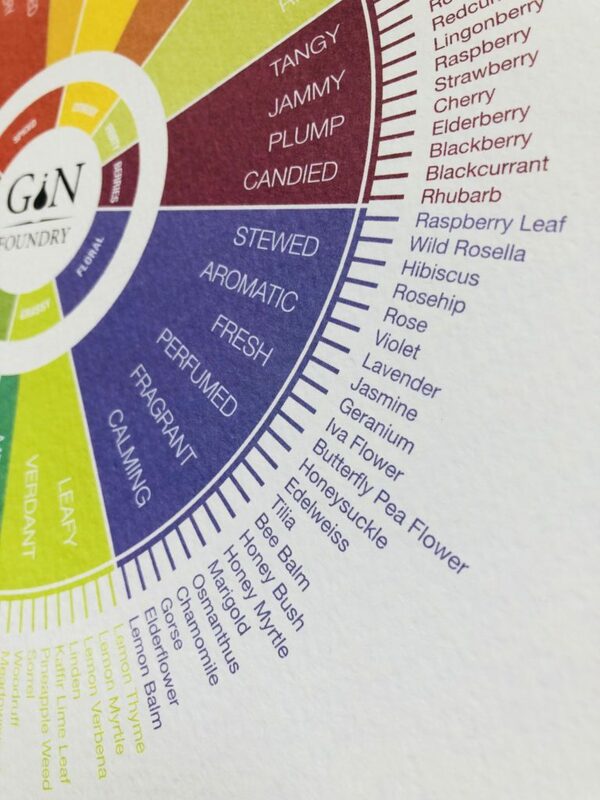 The wheel suggests that the gin’s qualities such as “stewed”, “aromatic”, “fresh”, “perfumed”, “fragrant” and “calming” are rooted in hints of certain flowers, both on the nose and on the tongue. Similarly, if you’ve noticed a hint of elderflower, for example, or the briefest sense of lavender, then you can describe your gin as calming or aromatic/fresh respectively. It’s an interesting notion and one that encourages thought and consideration, while allowing your nose and palate free reign. If asked to describe flavours and aromas in any food or drink, be it wine, whisky, chocolate or whatever, many people freeze, worried that they’ll give the wrong answer. Relax. There are no wrong answers. It’s your palate, your nose, your rules. That can, of course, be easier said than done. Maybe it’s because I’m a Londoner… Where to drink Fifty Pounds in the capital. What makes a London Gin? Which Type of Gin Girl Are You? What are bitters and why should you start using them in your cocktails?